Happy American Craft Beer Week to All! Honestly, every day is craft beer day for me. However, it’s great that there are so many fun events happening all across the nation this week. I actually kicked off the week yesterday by having happy hour on my own balcony with Great Divide’s Titan IPA and Ska’s Modus Hoperandi, two of my favorite Colorado IPA’s. 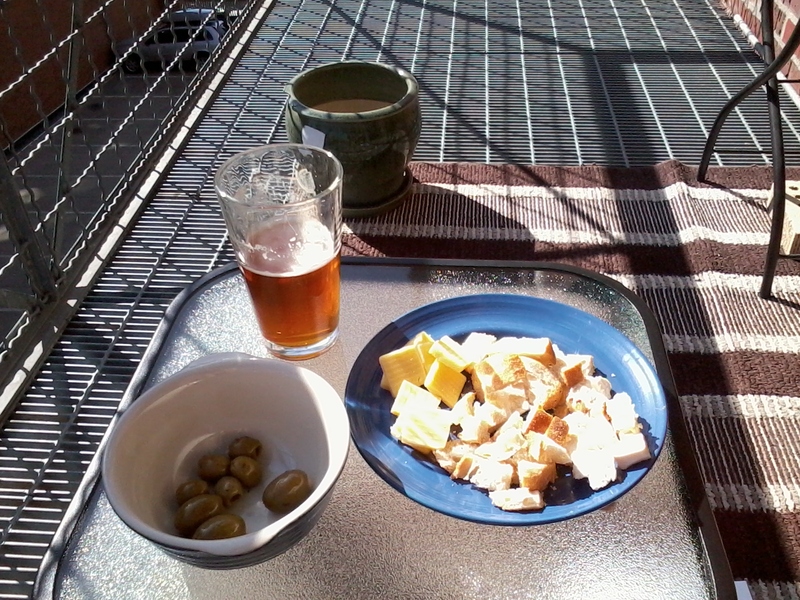 I paired the beers with a strong, sharp Cheddar cheese, spicy feta, bread, and olives. What a nice way to relax after a day at work. Tonight I look forward to heading over to an excellent neighborhood watering hole, Star Bar, for their Beer Cocktail Melee. $25 for twelve–that’s right–twelve different beer cocktails. This event sounds perfect for me, someone who’s not so sure about this whole beer cocktail craze. I will get my first taste of a bunch of Colorado beers mixed with local spirits concocted by 6 Colorado bartenders. I’m quite excited and look forward to letting you know how it goes. Previous Post The 1 Up: Great games, fun times, & craft beer!